One of the most important persons at Nimrod’s court in Ur of the Chaldees in Babel, or Babylonia, was Terah, the son of Nahor, a great-great grandson of Eber. Terah had three sons, Abram, Nahor, and Haran. The night before Abram was born, Nimrod’s astrologers were gathered at Terah’s house. Looking out into the night sky, they read in the constellation of the stars that the newly born child was to become the chief and the father of a mighty nation. This discovery was communicated to Nimrod, who became afraid that the new star might darken his own. Nimrod asked Terah to bring the newly born baby to the palace to be killed. Terah tried to talk Nimrod out of it, but he couldn’t. He risked his life and the lives of his whole family, and exchanged his son with a servant’s child born the same day as Abram. Nimrod did not suspect the ruse, and he killed the baby with his own hands. Meanwhile, Abram was hidden in a cave. Abram stayed in the cave until he was ten years old. During this time he came to believe in the existence of G‑d through reasoning. Abram had watched the sun and the moon and the stars coming and going, each in its own time. He had noticed the sun giving way to the moon, despite its apparent divine power, and the moon giving place to the sun in the morning. And so he reasoned that there must be a Power above and beyond all the visible forces of nature, a Power Who had created them, and Who regulated and controlled them at all times. Behind the limited power of all nature, young Abram perceived the unlimited and timeless existence of G‑d. Then G‑d made Himself known to Abram and taught him the right way of living. Later Abram went to the house of Noah and Shem. There he stayed many years; there he studied and learned to serve G‑d. Nimrod had long forgot ten the threat of the new star which his astrologers had predicted. He had rewarded Terah for his faithfulness and had given him even higher honors than before. For Terah was clever, and Nimrod took his advice in matters of state. Besides, Terah had always appeared an obedient servant with regard to the new idols Nimrod introduced in his empire. Nimrod had no reason to hold any grudge against Terah, in spite of his astrologers’ predictions. Abram had been taught the knowledge of the true G‑d, and he despised the idol worship of the people around him. He therefore decided to do everything in his power to crush the belief in idol worship. He talked to all the visitors at his father’s house and convinced many that their belief in idols was false and foolish. But Terah refused to listen to his son’s reasoning. One day, Abram took an axe and destroyed all his father’s idols. Only the largest remained intact. When Terah saw his idols shattered and scattered all over the floor, he accused Abram. But Abram said that the largest of the idols had killed all the others in a fight over an offering brought to them. Terah exclaimed that such a thing was impossible, since idols could not quarrel or fight. Then he realized that his son tricked him into admitting that the idols made of stone and wood could not even move, and he became very angry. Forgetting that he had long ago deceived Nimrod by substituting another child for Abram, he went to the king and reported his son’s irreverence towards the gods. Nimrod had Abram thrown into prison and condemned to death by fire. Hundreds of people crowded to watch the son of Prince Terah burn alive for disloyalty and disrespect towards the gods. For Abram had not kept quiet when he was brought before the king. He accused Nimrod of reducing his people to the idolatrous state of the generation before the Flood. When Abram was condemned to die by fire, he exclaimed before the court that Nimrod had no power against the will of G‑d. 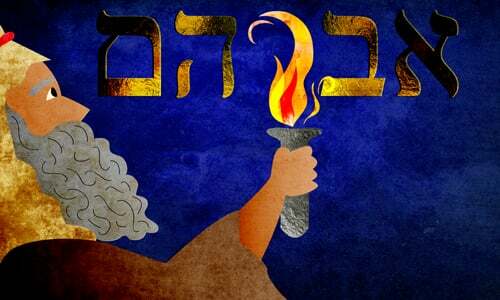 The fire could never harm him if G‑d did not wish it to, for He who gave fire the strength to burn, could take it away. His courageous speech had spread all over the country, and everyone, rich and poor, young and old, was eager to find out whether Abram was right, or whether he was just a boastful dreamer. Abram was thrown into the fiery furnace. But G‑d was with him and the fire did not touch him. It only burned the rope which bound him. For three whole days and nights, hundreds of people could hardly believe their eyes, seeing Abram walking in the midst of the flames, without having even a hair of his head burn. King Nimrod himself had to admit that Abram had spoken the truth and that he was a man of G‑d. He asked Abram to come out of the furnace. Nimrod then gave Abram many presents and sent him back to his father’s house. But Abram did not go alone. For with him went two hundred men of noble descent, amongst them, Eliezer of Damascus, who was later to become Abram’s most trusted servant. They all abandoned Nimrod and his rich court to live with Abram and learn from him the knowledge of the true G‑d. Abram married Sarai. He lived with Terah until Nimrod sent for him again, this time intending to kill him secretly. But Abram learned of this plot in time, and escaped to Noah’s house, where he had lived as a young man. Terah followed him there, and together they went to Haran in Aram Naharaim, or Mesopotamia. But the people in Mesopotamia did not worship G‑d. They worshipped all kinds of idols and followed the wicked ways of Nimrod and his people. G‑d saw that Abram was the only one who was righteous and G‑d fearing. G‑d, therefore, appeared to Abram and said: "Go forth from your land and from your birthplace and from your father's house, to the land that I will show you. And I will make you into a great nation, and I will bless you, and I will aggrandize your name, and [you shall] be a blessing. And I will bless those who bless you, and the one who curses you I will curse, and all the families of the earth shall be blessed in you." Abram did as G‑d told him. At the age of seventy-five years, he left Haran, accompanied by his wife Sarai, and nephew Lot, the son of his brother Haran. They wandered into the land of Canaan. Here, near the city of Shechem, in the oak groves of Moreh, G‑d again appeared to Abram and said: “This land I shall give to your children.” Abram built an altar to G‑d and traveled through the country to spread the knowledge of G‑d wherever he went. Of course it does. This is not at all a vindication of Terah's actions. It is just the story of what happened. Not only Abraham was a muslim (according to the muslims) but Jesus was a muslim too. When we come with our scriptures to say otherwise they have an explanation for that: Our scriptures were tampered with ! Abraham 's first son Ishmael was the father of all Arabic/Muslim tribes/descendants, but Abraham was Jew. Read Genesis chapters 12-27th. Or just start with Genesis through Revelations & be Bless. If more people would believe we can, then we can! So please start believing it. I grew up in Israel, we shopped for sandals in the Arab Shuk and when an Arab neighbour needed eggs or something we all acted neighbourly. You have to live in peace and act in peace and believe in peace, each little guy and girl have to do their part, not leave it to the politicians. And it will slowly be a reality. Thanks so much for this information on the life of Abraham. Why wasn't it put in the bible ? Wow so much more information on Nimrod! I always wondered about his life besides being a mighty hunter.